I've been having an interesting discussion of climate change and climate education on a friend's Facebook page, and thought it might make more sense to move the conversation over here. The blog format is a little more conducive to long-format discussions than other social media. The chat began with a question about why Bill Nye would engage in public debates with creationists or would debate climate change on the Sunday magazine shows. It definitely gives the non-scientific camp a chance to present their views as legitimate, which is a serious concern given the snake oil they are peddling. But my hope for the debates (and maybe Bill Nye's, too) is that these public "debates" will reach viewers who might ascribe to a creationist viewpoint or a climate change denial opinion just because they live in a family or a community that has denied them access to accurate information. I think we take for granted the free an unfettered access to accurate science reporting, updates on medical studies, andfree venues for the exchange of ideas. It might be that folks who have been sequestered from that kind of information will tune in to see "their" side talk, but will have the candle of critical thought lit by "the other side." Any scientist will tell you, a little bit of doubt is a wonderful thing. This led to a discussion of climate change and how we know what we know. Differences of opinion were raised. Some folks had heard different things from different people. Others felt that whatever the facts of climate change are, that stewardship of the planet was most important. In order to help share information with the first group and to help empower the the positive sentiment of the second group, I thought I'd post what I think are the two most important graphs for explaining what is known and what isn't known about climate change. You could save them to your phone so you have them on hand to share whenever (J. Tuzo Wilson, the father of plate tectonics, is claimed to have carried around a little plate model with him in his wallet to show anyone who'd give him the time--he must have been a hit at dinner parties). This is from Shaun Marcott's 2013 Science paper. The graph shows temperature anomaly (with error bars that show the statistical range of potential uncertainty around the measurements) during the Holocene (the last 11,300 or so years) in the blue, black, and orange lines. Temperature anomaly is how much warmer or colder a year's temperature is from a specified long-term average. You read this graph from left (ancient) to right (modern). See that big spike at the end? That's climate change. What's cool about the graph is that it's derived from 73 different kinds of measurements of past climate, and breaks down warming by latitude and region (that's what they mean by "stack"--it's a lot of data stacked together). Something serious is happening to our planet! Now, no one who lived 11,300 years ago (in a cave) is still around to tell us how things were, so we rely on temperature records encoded in tree rings, corals, cave stalactites, etc. to measure the temperature in the past. These slow-growing, temperature-dependent natural phenomena are called "proxies." Folks shouldn't distrust proxies just because they are complicated or involve chemistry and math. Anyone who's ever had a strep throat test come back positive might still be alive thanks to proxies. We can't see strep cells with our own eyes, but doctors have devised chemical tests that can detect the presence of strep antigens and then change color (something we can detect) if they're there. The same level of care goes into devising climate proxies. We can't see temperature in the chemical zonation of a stalactite with our bare eyes, but we can measure the ratio of oxygen isotopes in it with sensitive tools to detect the changes different air temperatures caused to the composition of the rock over time. By measuring lots of these temperature-dependent phenomena over time, it's possible to reconstruct the history of past climate around the world. It's like sifting through thousands of newspaper weather reports from ancient history. Each proxy says "on this date, right here, it was this temperature." The second image is the model that helps explain what forces are driving the data. The term "model" can be confusing sometimes. For most people a model means "a small version of something that doesn't do everything the big one does." A model airplane looks like a plane, but doesn't fly you to London. J. Tuzo Wilson's plate tectonics model was cardboard and couldn't possibly capture everything that's going on in the Earth's crust. A climate model is different. A climate model is a collection of equations (mostly drawn from thermodynamics--the scientific laws of how heat moves through the universe) that describe the physics of the climate system. It's like the engineering model of the computer or phone you're probably reading this post on. Engineers combined the known behavior of semiconductor chips, resistors, LEDs, etc. into a system so that they could predict how electricity and binary code would move through the complex parts of the computer to display the desired information. Now, your phone doesn't know what you're going to say next (in the same way the output of a climate model isn't prescribed), but the components of the phone are capable of capturing your voice, digitizing it, and transmitting it in a coherent way. The climate models have components that describe how heat and water and sunlight combine to make our planet tick. A computer solves these calculations step-wise so that physical laws (conservation of mass, conservation of energy, etc.) are obeyed. What comes out is a dynamic view of how our climate responds to forcings. Forcings are things like changes in solar intensity, or injection of volcanic ash into the atmosphere, etc. that cause changes to the climate. By analogy, heat from the stove burner is a forcing in the stove-teakettle system. Turn up the heat (change the forcing) and the system responds: the teakettle heats up. 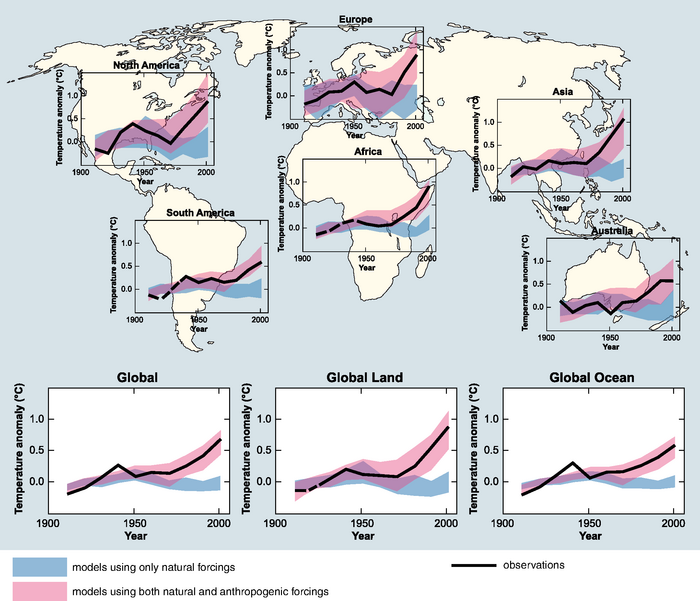 So what's in this amazing figure from the IPCC? The map shows for each continent and the global ocean the observed temperature anomaly (black line), the climate model output for the same time period with only natural forcings (blue bars--it's the range of a lot of models), and the climate models that include anthropogenic CO2 and other emissions (methane, soot, etc.). What's amazing about this picture is that it shows that scientists around the world cannot explain changes to our climate if they only consider natural forcings. To explain what our planet is doing, you have to include human activity. That's what scientists mean when they say things like "More than half of the observed increase in average surface temperature from 1951 to 2010 is very likely [90-100% probability] due to the observed anthropogenic increase in [greenhouse gas] concentrations." It's not that we want global warming to happen, it's not that we feel guilty and want to pin the blame on humanity. It's that the only explanation for the observed facts that fits is that humans are playing a huge role in changing our planet. So there you have it--what's going on, and why it appears to be going on in two graphs. It's scary, awesome data. What people do with the results is up to them. My advice: learn to adapt. The world is changing around us whether we like it or not. Better to learn to be happy and wealthy and productive in a changing world. But if folks want to ignore the observations and the best explanations for why change is occurring, that's fine too. Like their Holocene ancestors, folks are allowed to live in a cave. I'd just suggest living in a cave well above sea level.